The Weaver Road Bridge was outdated and in need or replacement or repair. 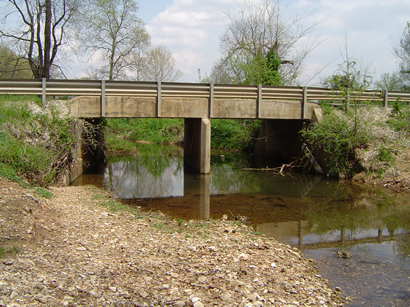 The Missouri Department of Transportation and the city of Springfield desired a new bridge of culvert that would accommodate stream function and prevent damage to the stream associated with a locally over widened channel. 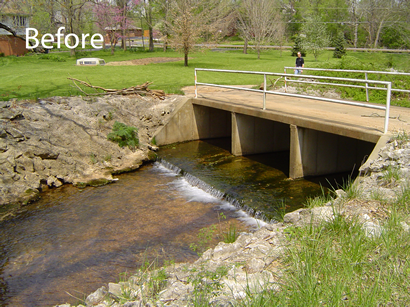 Intuition & Logic was retained by Mathews & Associates, Inc. to provide the design for the culvert and channel improvements. RatherRather than a standard triple box culvert, Intuition & Logic re-designed the crossing with a two-stage, conservation culvert. The final design was a culvert crossing consisting of multiple boxes, designed to pass a range of flood events. A 10’ W x 14.5’ H low flow box culvert the center, and flood conveyance capacity was provided by three additional culverts. The additional culverts were positioned 2.5 feet above the invert of the low flow culvert, creating a simulated two-stage channel. An additional culvert was included to function as a pedestrian walkway and underpass for the greenway trail. 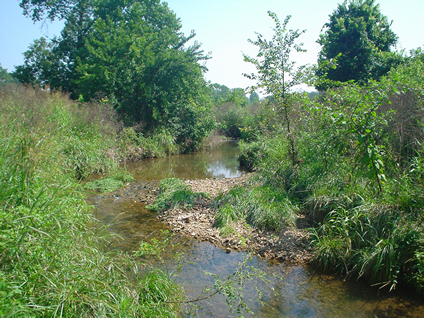 Approaches to the culvert, both upstream and downstream, were stabilized using a series of rock grade controls, toe armor and revegetated streambanks.